To Cite: Kawai T, Yamazaki S, Iwama A, Higaki T, Sugitani M, et al. Focal Sinusoidal Obstruction Syndrome Caused by Oxaliplatin-Induced Chemotherapy: A Case Report, Hepat Mon. 2016 ; 16(9):e37572. doi: 10.5812/hepatmon.37572. Introduction: Sinusoidal obstruction syndrome (SOS) is a severe adverse event of long-term chemotherapy in patients with colorectal cancer. It usually develops as liver congestion due to diffuse microscopic obstruction in liver parenchyma. In contrast, it sometimes appears as a liver mass occurring with local parenchymal hemorrhaging, and is often misdiagnosed as liver metastasis. Case Presentation: A 40-year-old woman with rectal cancer underwent high anterior resection and partial liver resection of segment 7 due to synchronous liver metastasis. She received oxaliplatin-based chemotherapy (mFOLFOX6) as adjuvant chemotherapy for 6 months. A 13-mm irregular low-echoic mass was detected by CT in segment 3 of the liver 12 months after the operation. The mass was again resected as a liver metastasis because it had increased in size. The pathological diagnosis was focal SOS, which showed sinusoidal dilation and congestion by hepatocyte trabeculae in the liver parenchyma. Conclusions: Atypical irregular tumors should be considered as SOS when the patient has received oxaliplatin-based chemotherapy. A qualitative imaging modality diagnosis, such as with diffusion-weighted MRI, is superior to a morphological diagnosis in focal SOS. This imaging modality can prevent unnecessary operations. Synchronous and metachronous liver metastases are found in 20% - 25% and 35% - 55% of patients with advanced colorectal cancer, respectively (1, 2). Liver resection provides a 30% - 40% increase in the 5-year survival rate when metastasis is found only in the liver (3). However, two thirds of patients experience recurrence following curative resection. Thus, perioperative chemotherapy is common for advanced colorectal cancer (4). Oxaliplatin-based chemotherapy is effective and is the first treatment choice for advanced colorectal cancer. Recently, liver damage from long-term chemotherapy has arisen as a new clinical problem for colorectal cancer treatment. Sinusoidal obstruction syndrome (SOS) is diffuse liver damage that causes liver congestion (5). However, focal SOS mimics metastatic liver tumors and has been ineffectively treated by surgery in three previous reports (6-8). We report a case of synchronous colorectal metastasis and metachronous focal SOS within one year. These masses were treated with surgery. We found that a qualitative imaging modality, such as diffusion-weighted MRI, can lead to an accurate diagnosis. A 40-year-old woman underwent high anterior resection for rectal cancer, with partial liver resection of segment 7 for synchronous liver metastasis. She received oxaliplatin-based adjuvant chemotherapy (modified FOLFOX6) for 6 months. On CT, a 13-mm irregular tumor was found in segment 3 of the liver 12 months after the operation. The laboratory data showed a slight decrease in the platelet count (12.8 × 104/mm3), with otherwise normal findings (albumin 3.8 g/dL, total bilirubin 0.8 mg/dL, aspartate transaminase 34 IU/L, alanine transaminase 22 IU/L, γ-glutamyl transpeptidase 15 IU/L, and alkaline phosphatase 45 U/L). All tested tumor markers remained normal after the first operation (carcinoembryonic antigen 1.8 ng/mL, carbohydrate antigen 19 - 9 13 U/mL, and α-fetoprotein 1.7 ng/mL). No splenomegaly was noted on CT.
Ultrasonography showed a 17-mm isoechoic tumor that was surrounded by a low-echoic area in the liver metastasis at the first operation. The pseudotumor of SOS was unclear on conventional ultrasonography (Figure 1A), whereas Sonazoid contrast-enhanced ultrasonography in the Kupffer phase visualized a 13-mm low-echoic mass (Figure 1B). Enhanced CT at the early phase showed a ring-enhanced tumor in segment 7 (Figure 2A), whereas the metachronous pseudotumor presented as an unclear hypodense mass without surrounding enhancement (Figure 2B). 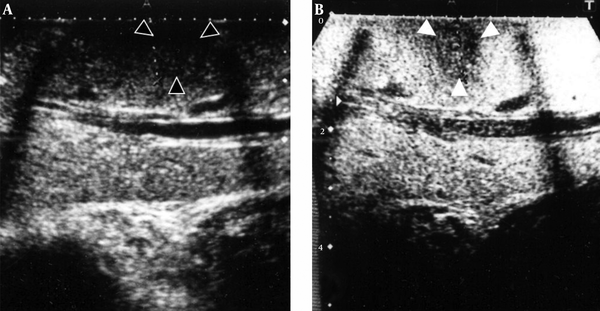 A, The pseudotumor of SOS presented as an unclear isoechoic tumor; B, The pseudotumor was clearly visualized as a low-echoic mass on the Kupffer phase of Sonazoid contrast-enhanced ultrasonography. A, Enhanced CT in the portal phase clearly visualized a ring-enhanced tumor of primary liver metastasis; B, The pseudotumor presented as an irregular hypodense mass without any surrounding enhancement. MRI revealed that the primary liver metastasis was a low-intensity mass on T1-weighted images and a high-intensity mass on T2-weighted images. The hepatocyte phase of Gd-EOB MRI and diffusion-weighted MRI clearly showed the mass to be a tumor. The pseudotumor by SOS also presented as a low-intensity mass on T1-weighted images (Figure 3A). However, the tumor was not detected by diffusion-weighted MRI (Figure 3B). This feature was confirmed on PET/CT. Therefore, the standardized uptake value of the pseudotumor was approximately equal to that of the liver parenchyma. A, The pseudotumor revealed a low-intensity mass on the hepatocyte phase of Gd-EOB MRI; B, The pseudotumor was not detected on the diffusion-weighted MR images. During the surgery, the pseudotumor was unclear with the use of conventional intraoperative ultrasonography alone. Therefore, we performed Sonazoid contrast-enhanced ultrasonography intraoperatively, and a low-echoic mass in segment 3 was resected. An irregular, non-solid, brown-colored mass was confirmed in the resected specimen (Figure 4A). Histopathologically, the tumors showed sinusoidal dilation and congestion by hepatocyte trabeculae, compatible with SOS (Figure 4B). The patient has experienced no recurrence of liver metastasis or SOS for 5 years. A, An irregular, non-solid, brown-colored mass was confirmed in the resected specimen; B, A massive hemorrhage in the liver parenchyma was observed (original magnification: 20 ×). Morphological imaging modalities, such as CT or US, are not suitable for the diagnosis of a pseudotumor caused by SOS, which always mimics liver metastasis and may be misdiagnosed with conventional CT or US alone. Consideration of the pathophysiology of SOS, which is congestion in the liver parenchyma, can lead to an accurate diagnosis. Qualitative imaging modalities, such as diffusion-weighted MRI, have diagnostic power superior to that of morphological imaging modalities. The “blue liver” caused by oxaliplatin-based chemotherapy is a specific adverse event that reflects the peripheral obstruction of hepatic vessels. SOS is recognized as sustained sinusoidal endothelial cell injury, which results in centrilobular hemorrhagic necrosis. SOS widely affects the liver parenchyma, but the clinical symptoms are nonspecific; elevated transaminase levels, jaundice, hepatomegaly, splenomegaly, and ascites are characteristic clinical manifestations. Moreover, occult parenchymal damage due to chemotherapy results in increased intraoperative blood loss, a high complication rate, and delayed liver regeneration after liver resection (4, 5). In contrast, focal SOS lacks clinical manifestations and mimics colorectal metastasis. Therefore, the use of conventional morphological imaging alone may lead to a misdiagnosis. Three previous reports have demonstrated cases of focal SOS mimicking colorectal metastasis after chemotherapy. All cases had a history of advanced colorectal cancer surgery and adjuvant chemotherapy (Table 1). Ultrasonography showed a non-specific mass and CT showed an irregular hypodense lesion. Gd-EOB MRI, which was considered to be the most reliable modality in colorectal liver metastasis, showed a defect in the hepatocyte phase, similar to imaging findings of colorectal liver metastasis. Therefore, a qualitative imaging modality, such as diffusion-weighted MRI, may be superior because the cellular density is higher in cancer than in pseudotumors (9). Additionally, pseudotumors do not show uptake on PET, whereas 90% - 94% of liver metastases are detected with PET/CT (10). Present case Liver metastasis T3N1M1 CRM mFOLFOX6 (12 cycles) Slightly hyperechoic Hypodense lesion T1: low intensity, T2: high intensity, EOB: defect on the hepatocellular phase N.D. N.D.
Abbreviations: CRM,colorectal metastasis; DWI, diffusion-weighted image; EOB, gadoxetic acid-enhanced magnetic resonance imaging; N.D., not detected. In the present case, two different tumor etiologies were treated within a year in a patient who underwent postoperative chemotherapy. One of the options was to perform a needle biopsy before the operation; however, due to a fear of tumor-seeding from the biopsy, an inappropriate treatment was performed. Qualitative imaging should be performed in cases of atypical tumor. The consideration of focal SOS may help prevent unnecessary surgeries. Authors’ Contribution: Takaharu Kawai collected data. Shintaro Yamazaki performed the operation and wrote the manuscript. Nao Yoshida performed the operation; Tokio Higaki performed the operation. Masahiko Sugitani made the pathological diagnosis. Tadatoshi Takayama integrated this manuscript.